As a key player in the intelligent mobility field Ford had invested in technology that allows them to send in-car diagnostic messages from individual vehicle to a central server. Such messages constantly report on the state of the car – speed, steering wheel angle, engine diagnostics etc- are are used within the car to for a huge range of purposed from deciding whether an oil light indicator should turn on, to whether to deploy an air bag. Even within a single vehicle the volume of this data delivery is enormous – across a fleet of vehicles, it becomes extremely challenging to process. Many metrics, such as direction and acceleration, are represented by up to 10 messages per second. Others, such as left/right indicator, will go many minutes without change, and so without any reporting of current state. The company were struggling to make any meaningful sense of this data, which was hard to aggregate, cross-reference, or summarise. TransportAPI worked with Ford to create a much more logical data model allowing detailed analysis providing a synopsis of what was happening to every moving car, for every second of its journey. Every data sample was cross referenced against contextual information including weather reports and information about the section of the road network that the sample was collected on. We were also able to provide public journey information specifically for each journey demonstrating how long it would have taken to undertake the same journey by public transport. 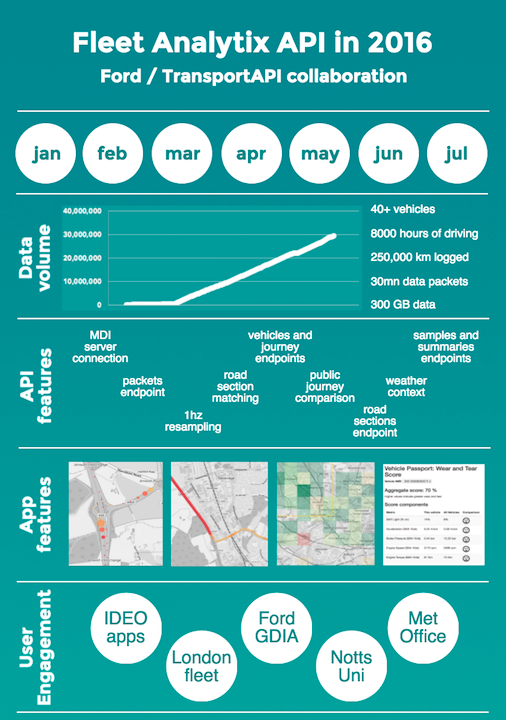 TransportAPI’s capability to handle extremely large volumes of data was critical: roughly 40 billion data packets from a fleet of 50 cars were received over a six month period. Our data models and the API developed on top of them allowed us to structure and aggregate the data to provide answers to real world questions interactively. For example, our platform could respond to a query requesting the average speed of the entire fleet in the rain as opposed to the dry, in less than one second. The size of sample required to respond to the query automatically configured according to how processing intensive that query was. This approach allowed us to identify those individual drivers who tended not to slow down in bad weather conditions, and communicate this to them through a “driving score”, encouraging a positive change. Having this ability to analyse and surface the behaviour of an entire transport fleet provides significant benefits not just to vehicle manufacturers but potentially to city planners. Using the data its possible to understand the reasons for dangerous or hazardous driving, vehicle hotspots or breaking at high speed for example. Having this data is also invaluable to drivers themselves. One aim may be to reduce the wear and tear on your car. The platform developed for Ford supports the development of tools that allow you to compare yourself with other drivers – in terms of smoothness, extremes of acceleration and braking – and so construct a specific wear and tear index to help you improve.